When folded, the Savior MTS is very compact (here showing the concealable pocket for firearms or other items). The Savior MTS contains three foldable sections of Level IIIA ballistic Kevlar carried in waterproof 1680 ballistic nylon. These sections fold up in a no-crease design to form what appears to be a laptop computer case. The Savior MTS can be locked into place for carrying discreetly, but can easily be unfolded to its full-length by a quick, sharp jerk of the carrier. This can be accomplished with or without the rifle-graded armor plate installed. 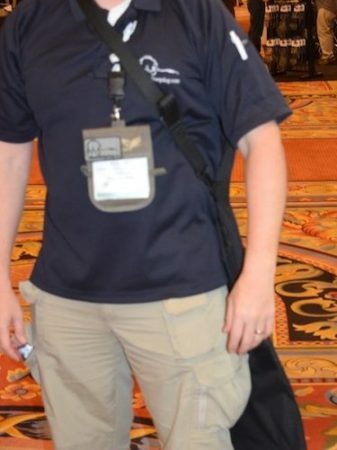 The author in the process of deploying the Savior MTS at SHOT Show. The hand carry handle for the folded Savior MTS becomes the shield carry handle in a very easy to manipulate opening. The user simply turns the support hand palm up to grasp the handle, instead of the more traditional palm down method for carrying a case like this. Then the user raises the Savior MTS to about shoulder height, and briskly jerks the shield downward to overcome the Velcro connections between the three sections. A series of pictures showing the Covered 6 Savior MTS being deployed. 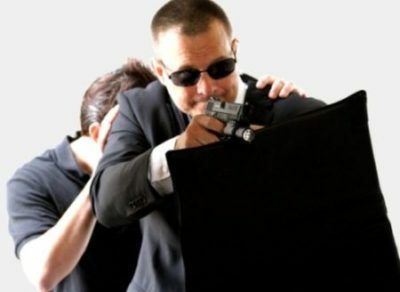 Level IIIA is considered to be the highest threat protection in the “soft” or concealable body armor categories. Level IIIA Kevlar is more bulky than the Level II and IIA products, and tends not to be used for officer duty body armor for that reason. Level IIIA is National Institute of Justice (NIJ) rated to protect the user from .44 Magnum semi-jacketed hollow points, and 9mm sub-machine gun fired FMJ rounds, in addition to all the pistol calibers protected by lower level armor. The top section of the Savior MTS comes with an internal pocket specifically designed to hold a rifle-graded armor plate. 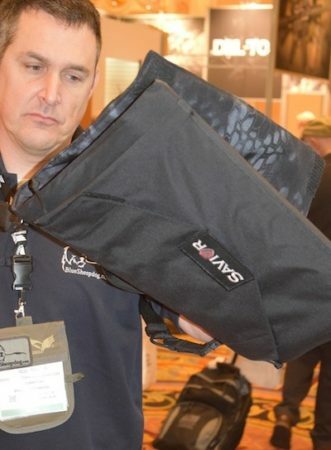 Unlike most ballistic shields that weigh 15-20 pounds (and many of which are only Level IIIA), the Savior MTS weighs only 6 pounds alone, and only 10 pounds with a rifle-graded armor plate inserted. The tremendous savings in weight provides the user far greater mobility, with much less fatigue potential. For a similar comparison, the Safariland Assault 3 Shields (Level III – rifle rated) are 15 lbs. (16.0″ x 30.0″) or 19 lbs. (16.0″ x 39.0″). Inserting the rifle-grade armor plate is easy, and only adds 4 lbs. The addition of the tailor-built Covered 6 rifle-grade armor plate raises the top section of the Savior MTS to Level III protection. Level III protects the user from most standard 7.62x39mm (AK-47), and 5.56mm (AR-15) rounds, though does not quite reach the protection of Level IV that will defeat .30-06 armor-piercing rounds. 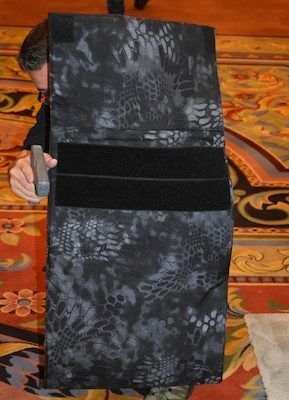 As designed the Savior MTS could become an ideal ballistic shield for SWAT teams, or patrol officers. The ability to fold the Savior MTS into a nice compact package cannot be understated, especially in cramped armored vehicles or patrol cars. 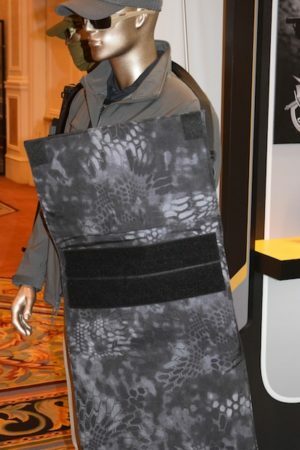 By adding the rifle armor plate, a significant amount of the officer’s upper torso (a primary target) is protected, and a large portion of the officer’s body is still protected at Level IIIA coverage. Quickly and easily deployed and carried, the Savior MTS could provide vital protection during the most critical law enforcement responses. Quickly deployed, the Savior MTS provides Level IIIA or Level III protection for the user and others. Another look at Savior MTS carry options, and protection. One of my concerns was how the lower two sections (with just Level IIIA Kevlar) would hold up to gunfire without being in a solid encased cover. The sales rep advised that there was some rearward movement of the Savior MTS, but rated bullets were stopped much like throwing a baseball at a heavy blanket hung loosely from a rod. That made sense to me, but I would really like to see it in action to confirm the claims. 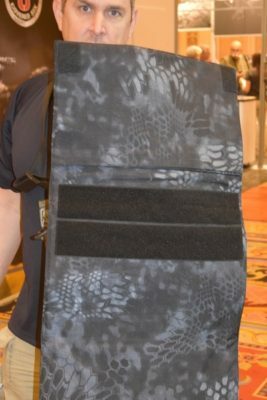 The Savior MTS was a specific response from customers requesting a ballistic shield that could be used in Active Shooter, or Spree Killer situations, and yet would not be as offensive in appearance as a standard ballistic shield. 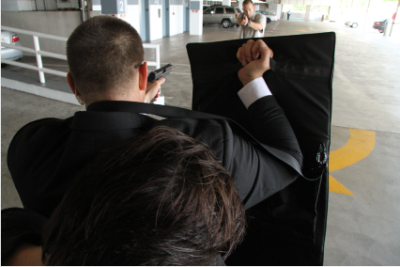 The Covered 6 Savior Multi Threat Shield can be used for executive protection, home defense, business/school defense, and public safety first responders. The Savior MTS is designed to be versatile and effectively protect against handgun and rifle rounds. 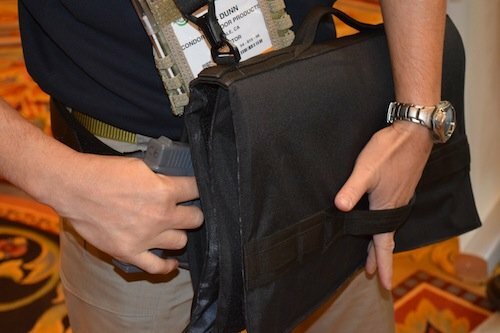 The folded “laptop case” Savior MTS in the background, with rifle-graded armor plate in foreground. With the shoulder carry strap, users can quickly slide the Savior MTS to the rear of their body to allow reloading, weapons manipulation, and full use of their hands. In the event a rescue is being performed, and the shield carrier is required to assist, the ability to quickly slide the Savior MTS to the rear can provide incredibly valuable protection that standard shields do not. The shoulder strap allows for quickly displacing the Savior MTS to the rear to go hands-free. Covered 6 is dedicated to ensuring their products only go to those who have a legitimate and good use for their products. Individual purchases will likely be declined if the user cannot show they are law enforcement, first responder, security, or military. Covered 6 advises all buyers will be vetted to ensure their products only go to the “good guys”. In a kneeling position, the Savior MTS almost entirely covers a 6-foot plus man. Utility pouch with attachments (sold separately) for handgun, Taser, etc. The Savior MTS provides significant coverage. Covered 6 Partners with Condor Elite. The Covered 6 sales representatives were advertising their new Savior MTS at the Condor Elite booths at SHOT Show. 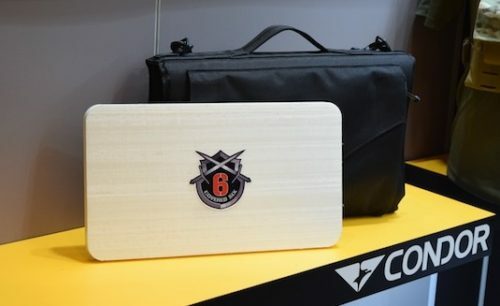 Condor Elite is a new subdivision of Condor products, specifically tailored to specialized military and police units, and Condor will be manufacturing the Savior MTS carry case. The manufacturer of the ballistic Kevlar panels or rifle-grade armor plate were not provided by the Covered 6 reps. 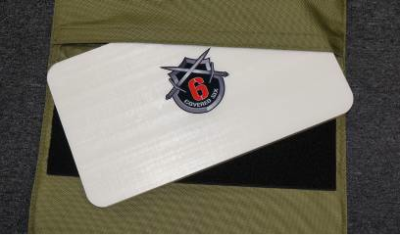 The Covered 6 Savior Multi-Threat Shield is designed to be lightweight, mobile, and discreet until needed for use. What really stood out to me was how well the Savior folded up to look like a common computer bag, or other shoulder-carried utility bag. When I first saw the Savior MTS, I literally thought Condor Elite was selling shoulder bags and almost walked away. Thankfully the sales representative saw my BlueSheepDog name tag and showed me the Savior. 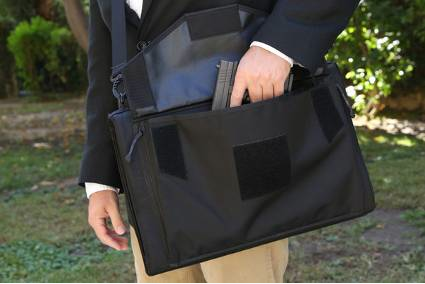 Concealable pockets provide discreet carry of pistols or other important items. After watching the Covered 6 sales reps run through the benefits of the Savior MTS I grabbed the floor model and performed some of my own movements and deployments. The Savior MTS was very lightweight in the stand alone Level IIIA configuration, and I felt I could heft the shield for hours on a deployment without gross fatigue. The addition of the specially made rifle-graded armor plate was noticeable, and would no doubt shorten the time a single user could actively keep the Savior MTS up and ready. However, even with the rifle plate inserted the Savior MTS was still much lighter than the standard ballistic shields I’m used to carrying. Hefting the Covered 6 Savior MTS was much easier than standard hard sided ballistic shields. We have not been able to see a test shoot against the Savior MTS, so all of the good features and characteristics may not live up to expressed claims. However, if the Savior MTS performs as advertised, I believe this would be an incredible addition to SWAT teams, patrol cars, or high-risk businesses and schools.